In a peculiar mix of world music, garage, prog, psychedelic folk, and a punk attitude We Here Now's debut is a release that is going to make you turn your head and stop what you are currently doing. Despite its small duration (21 minutes) this is a godamn tasty and groovy debut that's going to blow your mind away and make you ask for more. The Chikipunk Years is the debut album by We Here Now. 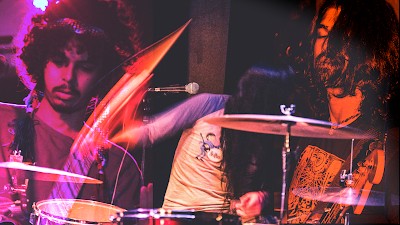 In it, the trio conjures a raw but complex sound, tending bridges between fuzzed-out forms of garage rock, prog punk and heavy psych, all infused with structures owned to South American, African and Indian music. Throughout these seven tracks the trio consolidates, on the one hand, a cohesive and fiercely direct sound while, on the other hand, delivers a challenging music full of odd rhythmic patterns and exquisite non-western scales, all tied with a playful production that reminds at times the ironic approach of Canterbury bands. Paradoxical yet intoxicating, We Here Now's debut album is the kind of record that wins the listener by K.O. We Here Now has been signed by Elektrohasch Records for a LP+CD release in May, and has signed on with Swamp Booking for a European Tour 2019. 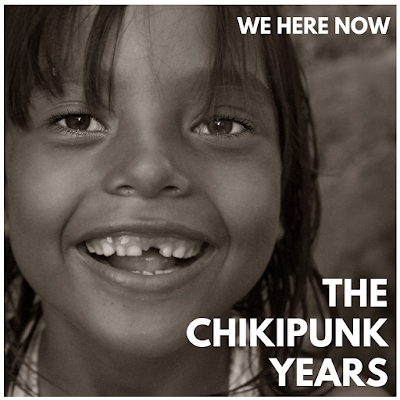 "We Here Now" is a multinational band, formed by the prolific musicians Pedro 'Sozinho' Salvador (Necro) from Brazil, Indrayudh Shome (Queen Elephantine) from India/USA and Panchito, el Sofista (Montibus Communitas) from Peru, who have independently toured throughout Brazil, Peru, US and EU several times, as well as release albums on labels such as Trouble in Mind, Beyond Beyond Is Beyond, Hydrophonic, Argonauta, among others. Emanating fast n' bulbous sounds, the music presents an exciting approach to the straight-forward aesthetics of fuzzed-out rock. They dig deep into their roots, unearthing the gifts of their vast cultural and historical backgrounds. Complex time signatures, original tonal schemes and a free-form sense of music-making are delivered with an unmistakable raw punk attitude.